Nice work Jay. Happy to have been an inspiration for a new quest, no matter where you take it. 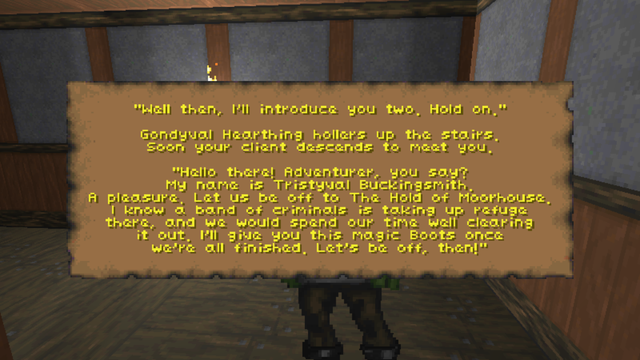 These quest are just awesome, I cant express my excitement about them enough! Its something I look forward to play thru when the time comes and I dissapear from the word to play DFU 1.0 Thank you Jay! Thank you! We're on our way to making Daggerfall Unity an unlimited experience. I hope everyone gets that excitement when they see the Bethesda logo and wonder, "What's today going to be like?" Fighters Guild #15: "Third Wheel"
That one is a bug on my end (feel free to make a report if you like) with "hide npc". This quest action should works OK for NPCs injected via quest system and named NPCs, but does not currently support ad-hoc commoner quests applied to static NPCs. I have this one in my hitlist to resolve soon. Yes, this was a rare case where I attempted to hide the questgiver. In the past I've tried to avoid doing that but I guess it slipped my mind here. As Interkarma said, this'll just have to be overlooked until there's time to get this part right. I really have enjoyed the new quests. Its really made the return to play this game much more fun even if dying is always the end game. Haha. Thank you I try to hold the quests I make to a very high standard, which is why I make them so infrequently. It usually just takes a combination of a good story and a good mechanic. The upcoming spell system will likely open up an entire dam of new ideas into DFU.